Homemade laundry detergent is super easy to make, and is SO much cheaper than buying store-bought detergent. If you’re like me and have hard well water, you might want to mix in a little bit of your favorite commercial detergent into your homemade mix to add a boost of efficiency while still saving money. 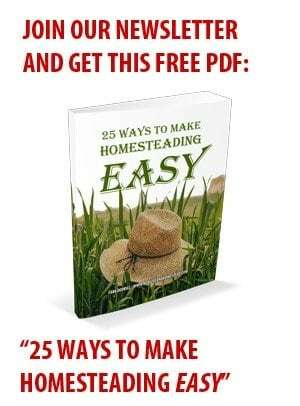 You can use Ivory, Zote, Fels Naptha, or even a homemade bar of lye soap in these recipes. 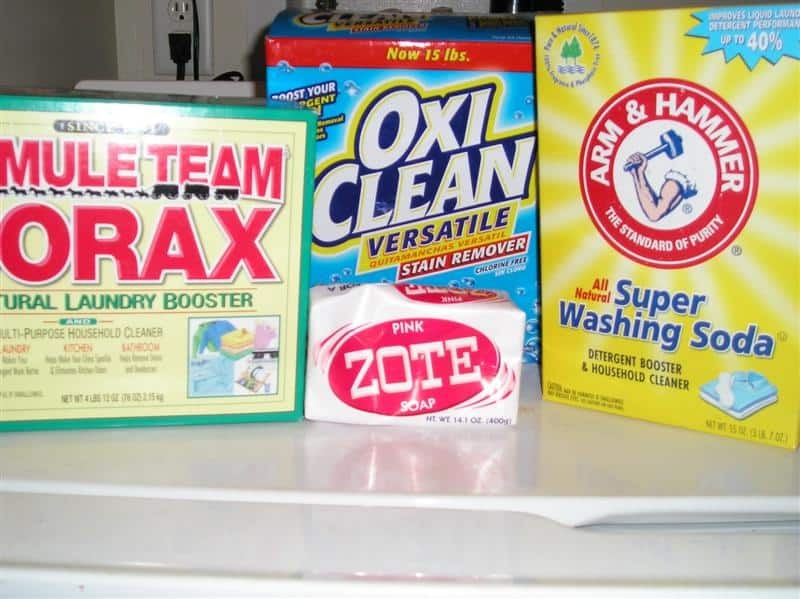 If you are having trouble finding Washing Soda, you can substitute Oxyclean. *Mix all together and store in a sealed container. For light load, use 1 tablespoon. For heavy or heavily soiled load, use 2 tablespoons. Mix Fels Naptha soap in a saucepan with 3 pints of water, and heat on low until dissolved. Stir in Washing Soda and Borax. Stir until thickened, and remove from heat. Add 1 Quart Hot Water to 2 Gallon Bucket. Add soap mixture, and mix well. Fill bucket with hot water, and mix well. Set aside for 24 hours, or until mixture thickens. Use 1/2 cup of mixture per load. You can read my review on the powdered laundry detergent HERE! Do you have a different laundry detergent recipe you like to use? I use 1 box borax, 1 box purell soap, 3 bars fels, 3# oxyclean and 1 bottle of Purell crystals (this is where the good smell comes from) and 2 lbs baking soda. Costs about $38.00 Use 1Tbsp for regular loads and 2 Tbsp for dirty loads, will do about a year’s worth of laundry. What about for washing baby clothes and cloth diapers? Are these recipes gentle enough? Especially if your little one has sensitive skin? Untill recently I had been unable to find Washing Soda at any of my local stores. I had a huge tub of Oxiclean left over from an old room mate so used that insted. Reading the lable I found that Oxiclean was mostly washing soda anyway, as far as I know it subbed in just fine. This is my first (out of 5) batch to use actual washing soda insted of Oxiclean. Three loads of laundry in I like this with Washington Soda better. I make the liquid in a 5 gal bucket (old kitty litter bucket) with 1 bar Fels Naptha, 1cp Washing Soda (or Oxiclean), 1/2c borax, and appr. 5 gal water. I use 1cp gell/liquid for a full load. Its incouraging to see people use this in their HE machines, I’m looking into getting one and was affriad i’d have to start buying the nasty expensive stuff. I’ve been making the liquid for some time now. I’ve simplified the process with the same results. Just dissolve all your ingredients (still shred the fels-naptha) in the warm water then pour into gallon jugs. Theres no need to let it sit for 24 hrs, I begin using it immediately. Just out of curiosity, has anyone tried the Oxyclean in the liquid recipe? I have and do use both of these recipes. They work wonders! I have found the liquid works especially good on stinky dish towels, that get that “old water” smell to them that tends to not come out with regular laundry soap. With the liquid one it does. Also we’ve all left the clothes in the washer just a little too long and they start to smell, well with the liquid recipe mine don’t do this! I use one tablespoon of a very similar dry concoction (it may even be identical) in my front loading, high efficiency washer. It has given me no problems at all. The big thing with HE washers is that too many suds can damage them. This recipe does not produce many suds (actually, less than store-bought HE detergents), so it doesn’t hurt the washer. I grate the soap with a star (parmesan) grater, so I have no problem with getting it to dissolve, even in cold water. Soaps like Ivory can be substituted for the Fels Naptha. The simpler the soap, the better. The results may not be quite as good, but, then again, they may be. What about high efficiency washers? I’ve seen this recipe, and the one from the Duggars’ website, but I’m afraid it might be too much soap/detergent for my washer. Thanks, and keep up the blogging– love it! I’ve found just tossing soap slivers from the bathroom into water makes a great base for the next batch, especially since I cannot find the Fels Naptha here. I’ve found that about a tablespoon or two of washing soda works fine on its own, if buying the other ingredients isn’t economical for you. Of course, I don’t have kids yet!